ABC Bartending Schools has a bartending school in Dallas / Fort Worth Texas and is the largest privately owned bartending school system in the United States. Tony Sylvester has owned bartending schools and has been placing bartenders nationwide since 1977. Thank you for your interest with ABC Bartending Schools and the bartending profession. 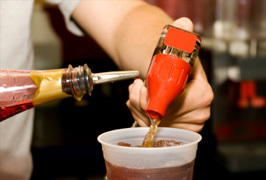 No matter what you decide contact or visit us before you make any decisions regarding bartending training as my schools in Dallas and Fort Worth have several unique advantages over any other bartending training program in the Metroplex. My staff is with you from beginning to end, they will answer your questions, invite you to visit and observe a class, show you current job placement history but most important they teach the classes and share there knowledge of bartending they have a personal interest to train you to become a professional successful bartender & will do all they can to assist you in finding that first bartending job. I say this as other programs have a sales staff & separate teaching staff and if you take the time to speak with the ABC staff or visit a school location you will understand what I mean. My instructors have 100 years of experience combined myself over 33 years in the industry, my director of Dallas over 22 years this experience in the classroom makes for a qualified ABC graduate and has opened up hundreds of job placement opportunities for graduates in the Metroplex. Visit any school and make sure you have an opportunity to speak directly with the instructors not just a sales representative when making a choice about bartending schools. If you are 18 years old or older, you could become a professional mixologist with just 40 hours of training! 1 Week Mon. - Thurs. Tony Sylvester has been placing bartenders nationally since 1977 and brings to his schools the art of matching the right face to the right place. Take a look at this job placement list for the Dallas, TX area, and the nationwide chains that have hired our students.